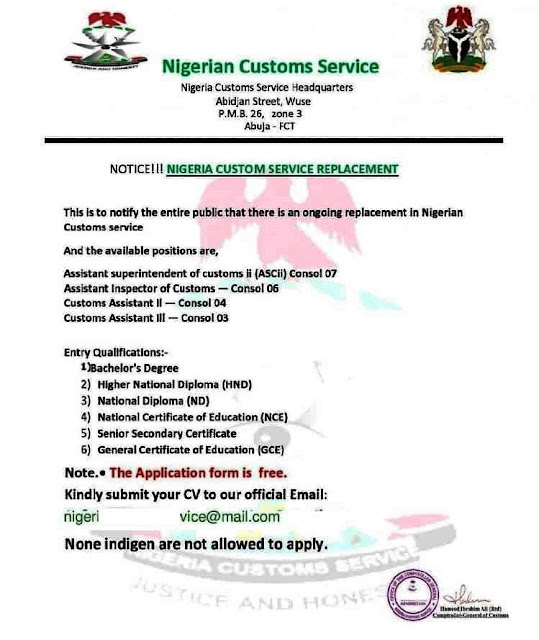 Home Federal Vacancies and Jobs Nigerian Customs Official Updates 2019 Nigerian Customs Recruitment Adverts: Is this True or a Scam? 2019 Nigerian Customs Recruitment Adverts: Is this True or a Scam? You have seen the latest Nigerian Customs Service recruitment/job adverts and you didn't know if it was a real publication or a scam for that matter. This post will address this. Non-indigen are not allowed to apply. Is the Above Adverts True or Scam? I have addressed this recently in my post, "Nigerian Customs Recruitment Form: Application Website/Portal, Updates and Applicants List Page". In that post, I was blunt to let you know that Nigerian Customs Service is not recruiting for now. If that happens sooner, you will be notified on this blog. That's why suggest you subscribe to my blog for regular authentic updates. Nigerian Customs will not recruit through email message - thereby asking interested applicants to send their CV to a particular email. I intentionally removed the email in the advert above because I don't want you to be tempted. And if the Service will use email, it won't be public FREE email like gmail, yahoo or mail, outlook etc. Note that the email above is a free email (@mail.com). And because the ads says it's a FREE form doesn't mean that they won't ask you to pay something along way. They are just baiting you to start with. Prospective applicants can also subscribe to this blog for immediate update to be sent to their emails when it starts. I will never ask you to pay anything. All I do here is to inform you of latest things out there and educate. You can also follow the Service on their official Twitter handle.